Visit Ignatius Press online at Ignatius.com for all the best in Catholic reading. 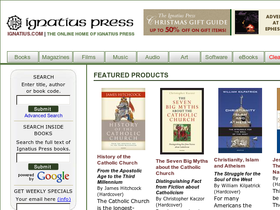 Not only does Ignatius Press have a wide variety of religious books, Ignatius Press is also the leading publisher in Catholic videos, music, and gifts. The Pope likes Ignatius Press so much he publishes his books through Ignatius Press. Save money on your next purchase from Ignatius.com with Ignatius Press discounts, Ignatius Press coupons, Ignatius Press promotions and Ignatius Press savings from 58Coupons.com. Don't miss out on the Sale items at Ignatius.com where you can find savings up to 85%. Save 50% on a 6 month subscription to Catholic Report Magazine from Ignatius.com. Click link for details. Ignatius.com is now offering a 20% or more savings on their Current Specials. We saw DVD's, art work and more. Save up to $15 on select DVDs at Ignatius.com. Click link to view the selection. When you spend $50 or more on Ignatius.com, you'll get a book for free. Click link for details. Check out Ignatius.com and you can get Free Catholic News everyday. Click on the Catholic World Report to view.